Presmere Day Nursery first opened in July 1991. Since then, the nursery has grown from being registered for six children to 23 children. The nursery is comprised of a homely baby room, where we aim to cater for each baby’s individual needs and ensure that the care that they have is similar to what happens at home. 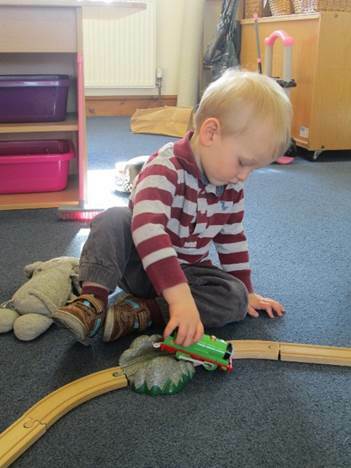 This allows them to settle in quickly and ensures they are not too disrupted by coming to nursery. Presmere Day Nursery baby room is a self-contained room which cares for babies from 3 months to approximately 20 months of age, depending on when we feel the babies are ready to make the move into the main nursery. There is lots of interaction between the baby room and the main room. The babies are very much a part of the nursery family and everyone benefits from this. It is particularly nice for siblings to be able to see brothers or sisters. The baby room incorporates a sleeping area and a safe play area. However, the babies do join in with older children for mealtimes, singing and out in the garden as much as possible and we start to introduce them to the main room as they get older and near to moving so that they get used to the new routine. There is always one nursery nurse solely for the care of the babies. However, if we have three very small babies, we will always try to have another person in the baby room. Our aim is to provide a homely, safe and secure atmosphere for the babies in our care. Every effort is made to continue the babies’ existing routines. Each baby will have a daily routine sheet to record all that they have done throughout the day, which is given to the parents at the end of the day. As with the rest of the nursery, the babies in our care will have a learning journey to record their individual learning and development in line with the Early Years Foundation Stage. Further details can be found on the EYFS page. We have prams and buggies available so the babies can go outside with the other children and on walks to feed the ducks, etc. Food can be provided by the nursery or brought from home initially, if parents prefer. Please note that we do not provide formula milk or nappies.